With intricate architectural features that transcend time, Brantford faucets and accessories give any bath a polished, traditional look. Classic lever handles, a tapered spout and globe finial give this collection universal appeal. This chrome rain shower shower only faucet is the perfect complement to the Brantford bath collection. This trim kit requires MOEN valve 2510, 2520, 2570, or 2590 to complete installation. The modern favorite. Mixing cutting-edge, space-conscious design with trusted GROHE performance, the Eurosmart Cosmopolitan collection is a stylish, sleek and streamlined choice for the modern bath. Eurosmart Cosmopolitan offers unparalleled purity of design with dynamic architectural formation. Eurosmart Cosmopolitan faucets transform a bathroom into a modern oasis of function and style. The contrasting design combination of 900 angles and curved accents evoke a sense of both excitement and calm. 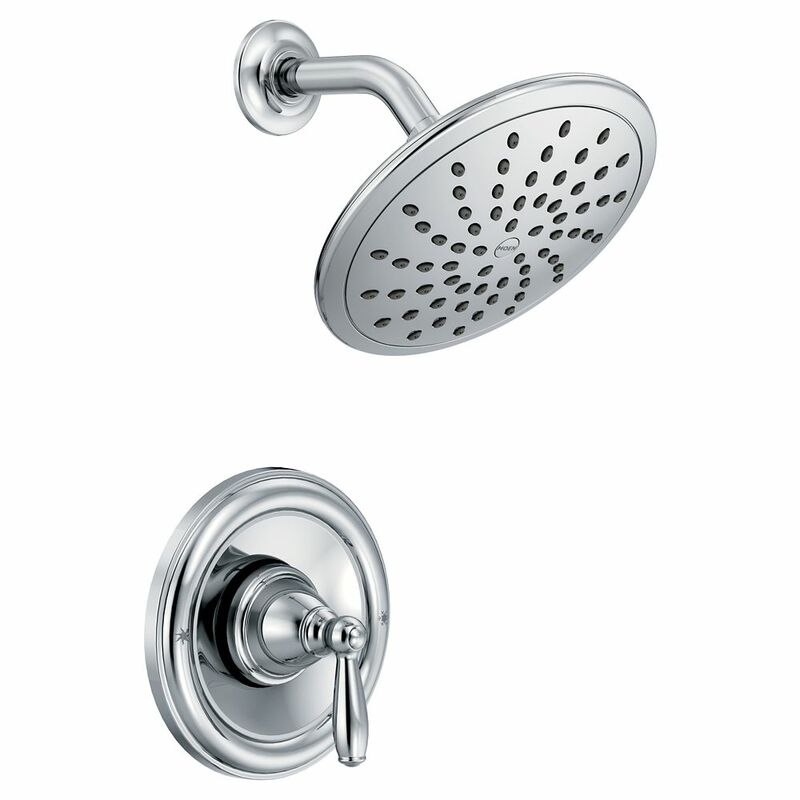 Brantford Posi-Temp Rain Shower 1-Handle Shower Only Faucet Trim Kit In Chrome (Valve Not Included) With intricate architectural features that transcend time, Brantford faucets and accessories give any bath a polished, traditional look. Classic lever handles, a tapered spout and globe finial give this collection universal appeal. This chrome rain shower shower only faucet is the perfect complement to the Brantford bath collection. This trim kit requires MOEN valve 2510, 2520, 2570, or 2590 to complete installation. Brantford Posi-Temp Rain Shower 1-Handle Shower Only Faucet Trim Kit In Chrome (Valve Not Included) is rated 3.5 out of 5 by 2. Rated 2 out of 5 by HomeDepotCustomer from The handle does not seem to fit or match the... The handle does not seem to fit or match the beauty ring. It sits about an inch away so instead of the snug finished look it seems like an after market product from a different OEM. However in terms of utility it Works fine.